LONDON, ON – An international collaborative study between Lawson Health Research Institute, Memorial Sloan Kettering Cancer Center, the Royal Marsden and Epic Sciences is one of the first to demonstrate that a blood test can predict how patients with advanced prostate cancer will respond to specific treatments, leading to improved survival. The test identifies whether or not a patient's CTCs contain a protein called AR-V7 in the cell's nucleus. The research team set out to determine whether the presence of this protein predicted which treatment would best prolong a patient's life. They found that patients who tested positive for the protein responded best to taxane-based chemotherapy while those who tested negative for the protein responded best to hormone-targeting therapy with drugs called androgen-receptor signaling (ARS) inhibitors. These are the two most widely used drug classes to treat advanced prostate cancer. "The study focused on a critical decision point when patients and their oncologists are choosing what therapy to pursue next," says Dr. Alison Allan, a scientist at Lawson and Chair, Department of Anatomy & Cell Biology at Western University's Schulich School of Medicine & Dentistry. "We are addressing a critical unmet need by validating that a blood test or liquid biopsy can be used to select a therapy most likely to extend a patient's life." "ARS inhibitors are the preferred first line of treatment because they target the hormones that provide the fuel for prostate cancer cells to grow," explains Dr. Allan. "However, at some point, cancer cells can figure out a way to survive without this fuel and become resistant to ARS inhibitors, in many cases through production of the AR-V7 protein. That's why chemotherapy is sometimes used a second line therapy." Through Epic Sciences' partnership with Genomic Health, the CTC blood test is now commercially available in the United States as the Oncotype DX AR-V7 Nucleus Detect. The research was supported at Lawson by the TELUS Ride for Dad/Prostate Cancer Fight Foundation and the London Regional Cancer Program Catalyst Grant with donor funding from the London Health Sciences Foundation. 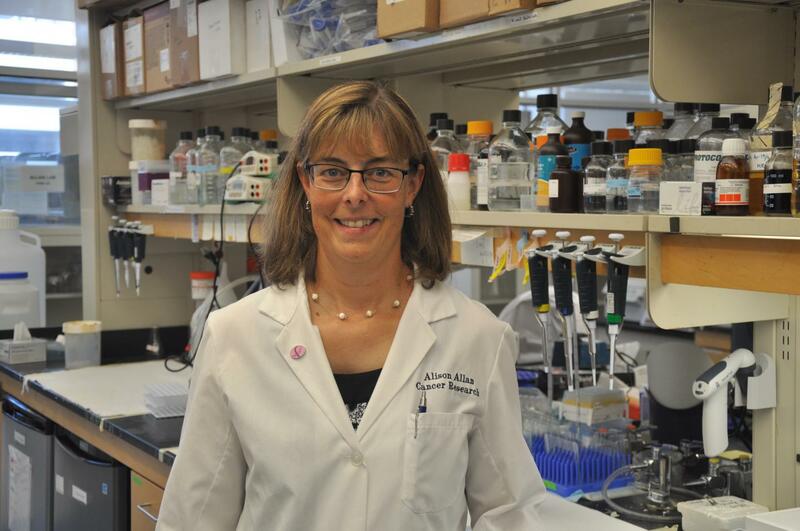 Dr. Allan's lab is located at the Cancer Research Laboratory Program. The study, "Assessment of the validity of nuclear-localized androgen receptor splice variant 7 in circulating tumor cells as a predictive biomarker for castration-resistant prostate cancer," is published in JAMA Oncology.